Producing that soundscape are her talented band of Damien O’Kane (acoustic and electric guitars) Duncan Lyall on double bass, Nick Cooke (diatonic accordion), Steven Byrnes (bouzouki & tenor guitar), Steven Iveson (electric guitar) and Josh Clark (percussion). Kate dips her toe in the sea for her ominous, mournful song The Mermaid with guest vocals from Dan Tyminski – an exquisitely sensitive number. The mood changes for the traditional upbeat Pace Egging Song celebrating the West Yorkshire Easter tradition of performing Pace Egg village plays in which St George combats all challengers, with bouzouki, whistles and flute sending it on its merry way. A cover of Scottish singer songwriter Archie Fisher’s The Witch of the Westmorland is haunting and delicate – O’Kane and Lyall’s musicianship providing a beautiful backcloth for the tale of the knight saved by the sorceress. Kate’s I’ll Be Wise could come straight from the tradition – the tale of a girl beguiled and betrayed – before stately strings herald the sublime Night Lament with Kate’s voice at its most captivating. 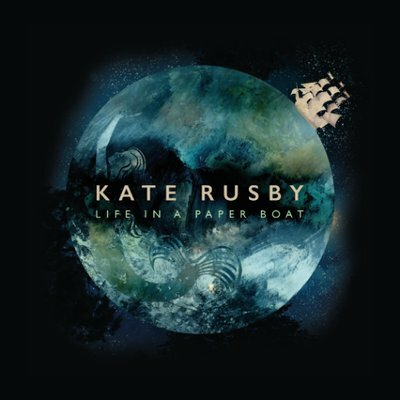 Life in a Paper Boat is perhaps the finest ever melange of Kate’s music – the broad brushstrokes of O’Kane’s bold, warm and expansive production illuminating her many strengths – from that unmistakable voice to her increasingly skillful songwriting and the way she gets right inside a traditional song. After two decades at the top of her game, Kate Rusby may no longer need any introduction, but make no mistake, hers is a constantly evolving story. Life in a Paper Boat will be launched on a 14-date UK/Irish tour starting September 28 taking in venues including Leeds Town Hall, Glasgow City Halls, Wales Millennium Centre, and Dublin’s National Concert Hall.